The story of the Aerotecnica helicopters goes back to the original research carried out in the early 1950s by Jean Cantinieau in France. Cantinieau, an engineer with Sud Ouest (SNCASO), designed his C.100 in cooperation with M. Decroze. It was an open frame single-seat machine with a triangulated tube structure surrounding the pilot and carrying the engine and rotor installation at its apex above the pilot's head. 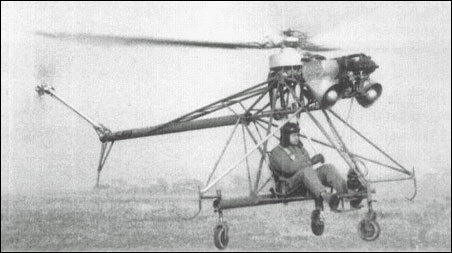 The engine was mounted just forward of the rotorhead so as to reduce the extent of mechanical linkages and the C.100 had a three-wheel undercarriage and high-set tubular tailboom structure carrying a small tail rotor. The C.100 made its first of a total of three flights on 10 November 1951 at St. Cyr and performed reasonably well. Cantinieau quickly moved on to a two-seater, the MC.101, which retained the general layout of the first machine but with a much cleaned-up structure and a 105hp Hirth engine.